LAS VEGAS – A bizarre controversy erupted late Friday afternoon following the weigh-in for the Floyd Mayweather-Marcos Maidana fight at the MGM Grand Garden that a Mayweather team executive said put the fight in jeopardy. However, Aguilar ruled a stock red pair of Everlast MX gloves were acceptable and he approved them for use. Mayweather complained about the padding in those, but Aguilar stood firm and said those were legal. He then ordered the sides to settle the dispute among themselves, since the commission had approved the Everlast MX gloves. Ellerbe left a meeting among the camps and said, "No fight." Golden Boy Promotions CEO Richard Schaefer said he expected the matter to be resolved and did not expect it to impact the fight. The ball, though, is in Mayweather's court. Maidana could agree to wear a different pair of gloves that are acceptable to Mayweather, if he chooses. But he could also stand his ground and wear the red Everlast MX gloves since the commission approved them. In that scenario, Mayweather's only recourse would be to not fight. But given that Mayweather is set to make a guaranteed $32 million-plus significantly more from pay-per-view revenues, it's almost inconceivable he won't fight. Maidana is making a career-high $1.5 million purse. 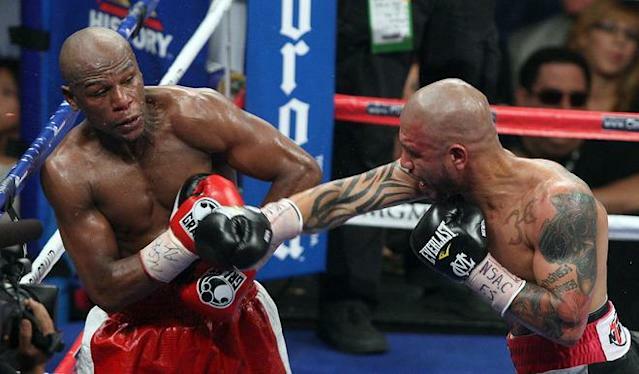 Curiously, Miguel Cotto wore the very gloves Mayweather is complaining about during a WBA super welterweight title fight against Mayweather on May 5, 2012, at the MGM Grand. Mayweather won that fight by a unanimous decision. According to the Everlast web site, the MX gloves are a "custom horsehair and foam blend [that] allows for optimal power transfer." Schaefer released a statement in which he said he expected the fight to go forward, despite the dispute over the gloves. "The camps are discussing the gloves," Schaefer said in his statement. "It is not a commission issue. The camps are still talking about it now, but everything will be worked out. Both guys want to fight. I’m not concerned about this issue."